In this unstable climate of boundaries drawn, borders disputed, and identities forced to bridge the middle ground, we're often pressured into seeing concrete lines of distinction. We're told to see others' differences as discordant notes of tension rather than as the harmonious elements of an orchestra. 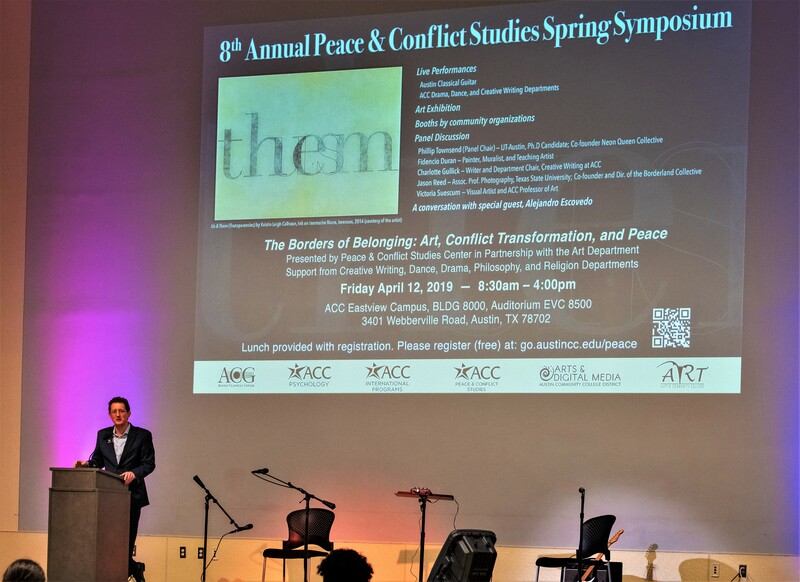 ACG was recently honored to perform at an event confronting these notions of division: ACC's 8th Annual Peace and Conflict Studies Spring Symposium on Friday, April 12. This year's theme was "The Borders of Belonging: Art, Conflict Transformation, and Peace." The event was a full day of art, music, and discussion focused on uniting discrete disciplines in a contemplation of how peace relates to borders. Executive Director Matt Hinsley described the transformative nature of the arts in a speech to introduce our performers. Tom Echols - experimental artist, Adjunct Professor of Music at ACC, and longtime friend of ACG - performed Barrios's Una Limosna por el Amor de Dios (Alms for the Love of God) and a variation of Leonard Cohen's theme on a French wartime folk song. He explained how music enables us to see the space between, allowing us to be more accepting of difference. 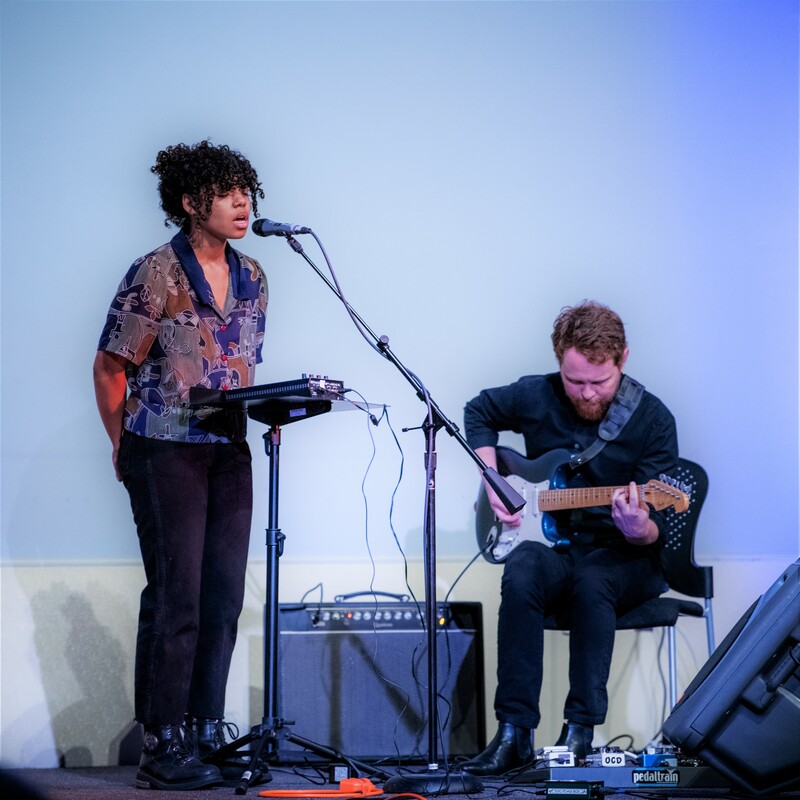 Travis Marcum, ACG's Director of Education, played some covers and some original compositions of 20-year-old vocalist Ta'tyana Jammer, a graduate of our McCallum High School guitar program who's carving a path into the music world. Travis shared how his perception of age changed during dream - ACG's community-based music project from last summer devoted to the voices, hopes, and dreams of young people in Austin. "Dream sought to erode imaginary borders of age through music. Time and life can systematically desensitize us to the emotions, the urgent sense of purpose we had when we were young. When I hear young people like Ta'Tyana pour their heart into music they create, I am reminded of the fire and the passion. I feel those feelings again. I carry them with me." 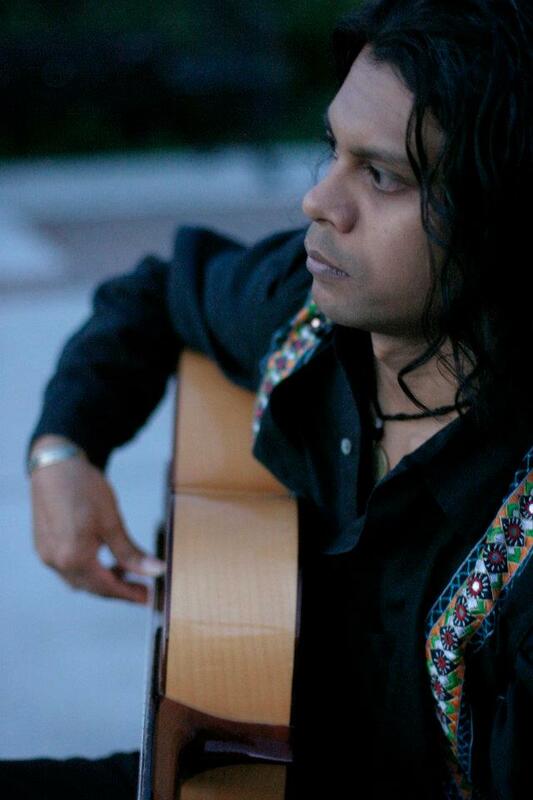 Oliver Rajamani, Austin guitarist notable for his Flamenco India project highlighting the Indian roots of flamenco, performed genre-bending music - such as a country song with an American accent - on both the oud and the guitar. "I’ve worked a lot with the Romani, a people long misunderstood by others. People say my music breaks borders. I’m not sure it does, but my whole life I’ve been able to connect with people from all walks of life: all ages, races, religions. Music has been instrumental - it crosses borders in a non-violent way. It touches people and affects them very deeply." The timing of ACC's Peace Symposium could not have been more serendipitous. A little more than 200 miles away, the "Bach Project" of world-famous cellist Yo-Yo Ma brought him on April 13th to the Juarez-Lincoln International Bridge, a crossing point between Mexico and the US. The Bach Project has taken Ma all over the world exploring connections between cultures using the centuries-old music of Bach. Before an audience with residents of both Laredo, Texas, and Nuevo Laredo, Mexico, Yo-Yo Ma performed the beginning of Bach's Suite No. 1 for Unaccompanied Cello. "As you all know, as you did and do and will do, in culture, we build bridges, not walls," he said. "I've lived my life at the borders. Between cultures. Between disciplines. Between musics. Between generations." We're so fortunate to exist in the midst of such thoughtful, creative music-makers. 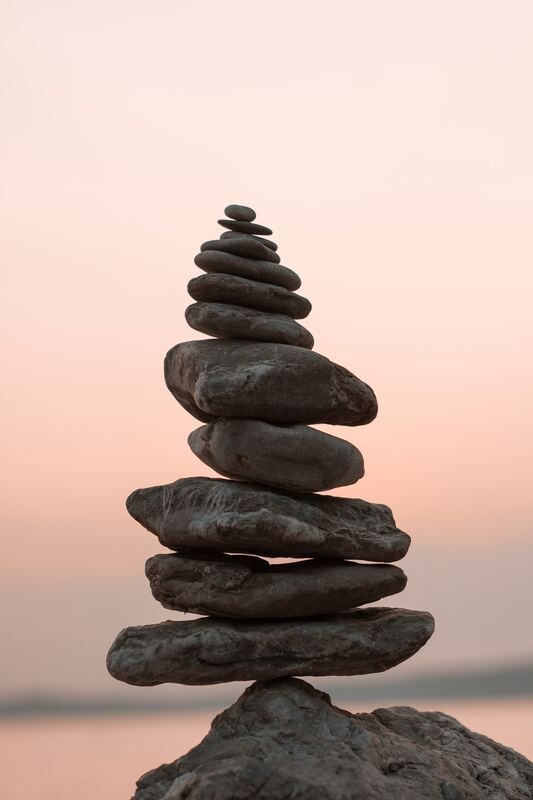 Through experiences such as the Peace Symposium and Yo-Yo Ma's Bach Project performance, we're reminded of the complimentary aspects of identity, of the components of our beings that strive for connection. We're reminded that the arts offer an opportunity to communicate with others from different backgrounds, an opportunity to dissolve constructed boundaries and provide spaces for belonging. An artist living both in Austin and Santa Fe, Patti Troth Black has been a dear friend of ACG for years, and has always been deeply appreciative of our work in the Lullaby Project. A few years back, she created a collection of paintings in honor of our work with mothers. At the Austin Tango! concert on March 2nd, an exhibit of her work was on display in the lobby before the Bandini-Chiacchiaretta Duo took the stage. We're so fortunate to have spoken with her recently about her artwork, her inspiration, and why she is so moved by the Lullaby Project. Patti was born in the "wild and rugged beauty" of West Texas. Always in love with nature and possessing an innate aesthetic vision, she has three degrees in subjects unrelated to art: a double major in English and Classics, a Master's of Fine Arts in Creative Writing, and an almost-completed Master's from the Episcopal Seminary of the Southwest. An ongoing shoulder injury prevented her from completing the seminary degree, but she was still able to paint and write poetry. "I have no training in art. I’ve simply been drawing and painting since I was five, and I’m in love with it." Her artwork, ranging from prints to paintings to panels of gouache-painted photos, often depicts natural elements breathed to life with vibrant, intricate patterns. "I am particularly drawn to rich floral and nature motifs on hand-painted furniture, which weave their way into all my tiny detail work. I use a lot of iridescent gold to represent touches of sunlight. Very often hidden in those patterns will be trees, leaves, tiny birds, all kinds of things that make up the concrete reality of life. That is the fabric upon which I build the final impression." "It’s usually something very close to my heart - I love nature, birds, trees, and light - so those motifs repeat over and over again; they inspire everything." 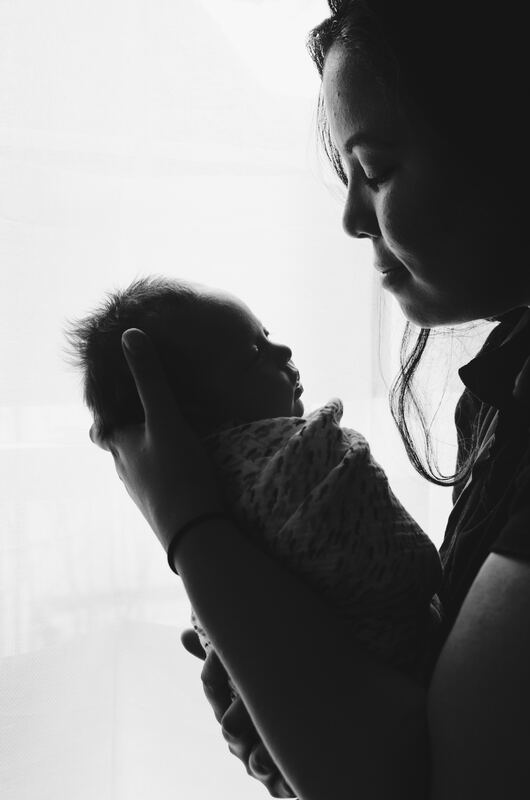 Her admiration of the Lullaby Project, the program that pairs expectant or new mothers with artists to write a lullaby together, stems from memories of her childhood. Because of events beyond her control growing up, she recognizes the intense bond music can form between a parent and child. "I was the first child, and my mother wasn't well - she didn’t want me when I was born. 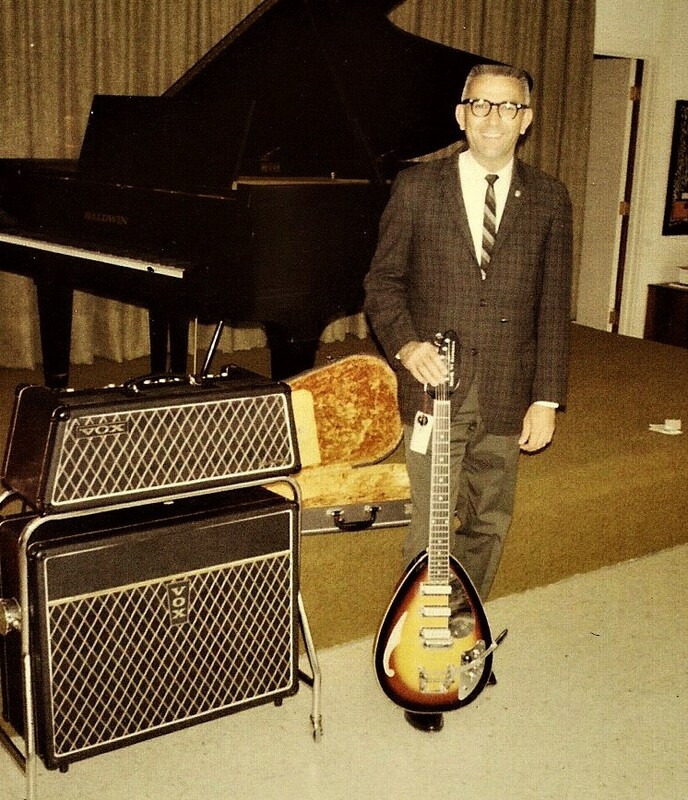 My father would come home and find me unchanged and unfed, and he would clean me up and feed me, and then he’d sing to me in both Spanish and English with his guitar. I think he saved my life." "My first language was music; I thought music was language. I was singing the songs with my father before I could even talk. In very difficult times of my life, if I can get a song going in my head, it takes me back to that place of a really gentle, sincere feeling of safety, warmth, and nourishment." 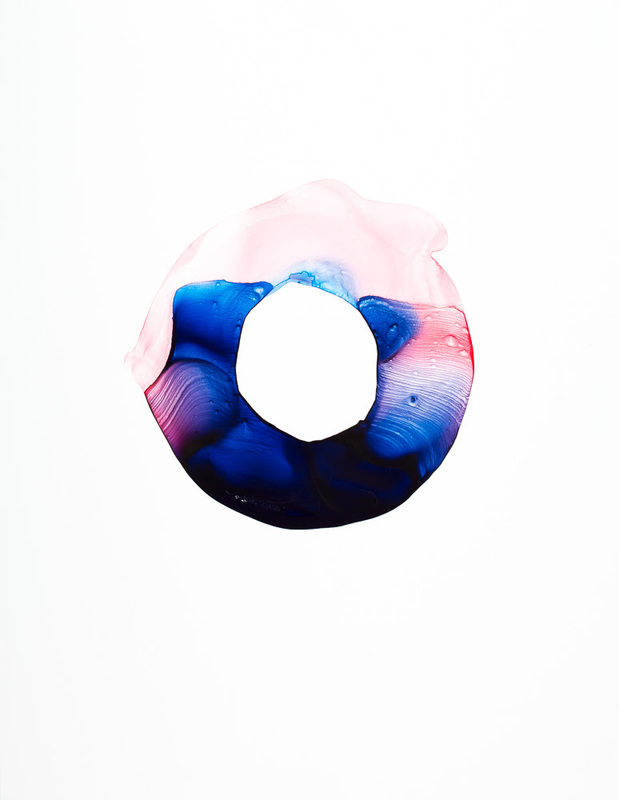 Over the past five years or so, her artistic vision has shifted focus toward photography. After falling in love with a 120 film camera she purchased from a friend, she began to print the photographs on heavy German etching paper. She was seeing certain aspects of the photographs stand out, and she wanted to paint directly on the photos. "I don’t plan things out ahead of time. I can see it in my mind’s eye, but everything tells me what it wants to be." She's been working for the past seven months on shadow, light, and reflection. The focus of these works is not on the objects themselves, but on their reflections. Similarly to noticing things within photographs that she would highlight through painting, Patti began to see elements leaping out of the reflections, and felt the need to bring them to life. "There's a photo I did in Santa Fe - light there is different than light here - and I’m holding in my hand a dark, almost sapphire blue bowl. It was so opaque that the reflection didn’t show the blue. But it did get brilliant little suggestions of aqua and turquoise that presented an aura around the scalloped edge of the bulb. As I began to look at it, I saw a tree holding up a city, and it made me think of Austin. The title is 'Nature’s Graciousness,' and it’s about the value of our oaks. No matter how much the city gets built and built, there are still oak trees everywhere. Sometimes they struggle up through things, but they’re still there." Patti's work is an ode to nature and the soul. She believes us all to be incredibly fortunate to live within nature's embrace, and her work draws inspiration from the everyday beauty of her world. "The earth is our mother: it nurtures us constantly, not only with its beauty, but with the fact that trees and plants exhale pure oxygen. In a city, the trees are constantly counteracting all the carbon dioxide from cars. Our spirits are immensely enriched by the birds. Right now, we have black-belly whistling ducks that come to my feeding area in the backyard - this is the third year in a row they’ve come back - and it’s so fun watching the ducks padding around on their duck feet in the backyard eating birdseed." Her favorite piece among those she's gathered for the exhibit on March 2nd depicts a mother and child. There's a tree growing alongside them, a tiny city down on the right-hand corner, and two birds carrying in a guitar. "That, to me, says it all." "A Gift for My Daughter"
This story is part of our "Music and Healing Initiative", the program we're highlighting in this year's Amplify Austin campaign. To learn more about our Lullaby Project and new partnerships with Dell Children’s Medical Center and The Livestrong Cancer Institute, and about how you can support this initiative, click here. Holly, a single mother, is searching for part-time work that fits the busy schedule of caring for her four-month old infant, Anna. Six months ago, faced with the prospect of raising her child alone and without close family in the area, she found Any Baby Can. It's an organization that provides counselling, classes, and in-home support to parents in difficult situations. Diane, her counselor through Any Baby Can, put her in touch with ACG and Arnold Yzaguirre, one of our Lullaby Artists. Over four appointments with Arnold last September, they discussed her feelings about pregnancy and having a child, and about what message she'd want to convey to her baby. 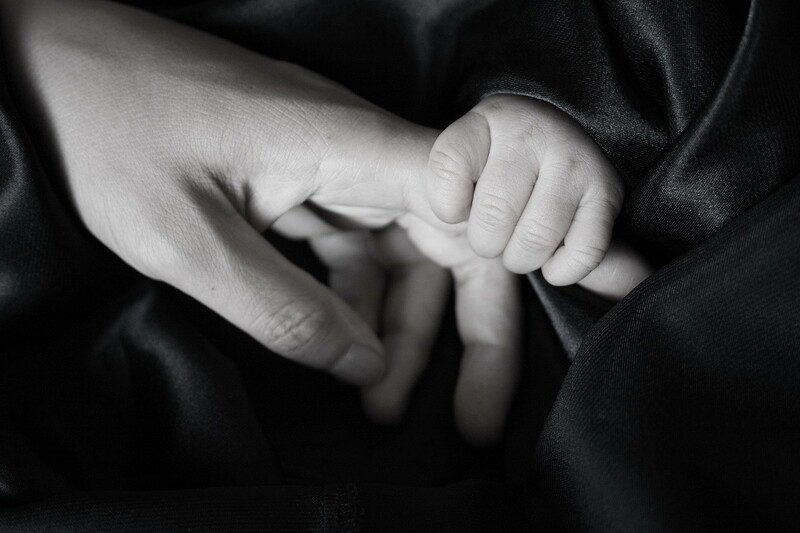 Mothers in our Lullaby Project have differing levels of ability and interest in the details of writing a lullaby. Holly has a background in music, so she came up with the melody, harmonies, and lyrics entirely on her own, and presented them to Arnold so that he could craft the lullaby on his guitar. "I’ve been singing since I was five, it’s a natural passion of mine. My dad can sing and play the keyboard - music is in the family. I did choir in high school and college, wrote songs with a friend - more like a hobby - and learned how to record in a studio." She is raising Anna in a musical manner as well, often singing to her infant at times when she is particularly fussy or bored. "I call them 'jam sessions': I put music on, and sing and dance with her. I mostly put on lullabies, or anything I can sing to. Anytime I turn on the stereo, she’ll stare at it like 'What is that?' She’s very curious." Holly's lullaby for Anna is inspired by love. She encourages Anna to be patient, kind, humble, and grateful, and to find a love that is true to guide her through life. The chorus is repeated phrases of "Oh love," and she wanted the title to be more unique. "This is a gift for Anna. I want her to be able to grow up and sing this song, or listen to it forever. It means a lot to me. We can’t live in a world without music; it really is healing, it really is inspiring. It helps lift you up." 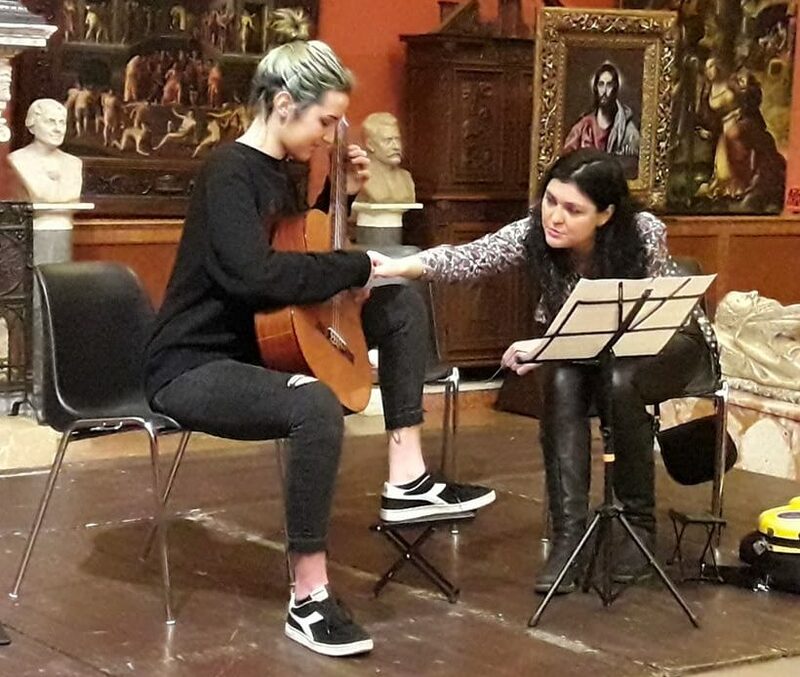 Holly enjoyed working with Arnold so much that she hopes to continue collaboration with him and other mothers to help them create songs of their own. "I already had a passion for music, but this sparked something in me ... It reignited some of my creativity. I hope this is something I can continue to do forever. Being able to share their love through music would be great." 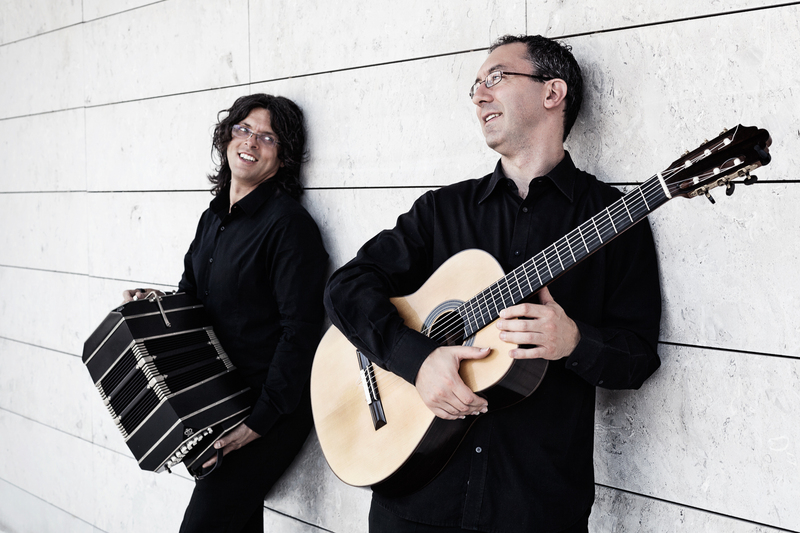 We couldn't be more excited for the Bandini-Chiacchiaretta Tango Duo's return to Austin for their third performance with us. Click here for more information about the Austin Tango! concert on March 2nd at 8pm in the AISD Performing Arts Center. Each concert, an energetic team of volunteers helps us out with everything from the Box Office to ushering to assisting our food vendors. One of our longest-serving volunteers, Pat Dickerson, has been dancing tango for over two decades. She has a unique perspective on tango in Austin, and why the Bandini-Chiacchiaretta Duo is special. Pat is a research geologist at the University of Texas - Austin where she serves on graduate student committees, collaborates with friends and colleagues, and leads Smithsonian trips to places such as Iceland, Machu Picchu, the Galapagos, and US National Parks. In addition to geology, Pat's second love is tango. "It’s one of the most wonderful things I’ve discovered - my passion for tango and geology are pretty close." Her first exposure to tango was her goddaughter's performance with Glover Gill's internationally renowned "Tosca Tango Orchestra" in 1997. Pat was instantly hooked. "I heard the music, saw the people dancing, and thought, 'There’s the rest of my life.' It was that visceral, that immediate." She signed up for a tango workshop and started taking lessons, gradually becoming more enthusiastic about it as time went on. "Week after week I built on it and became more and more - I don’t want to say obsessed - more enamored of it." The roots of tango music go back to docks on the port of Buenos Aires. 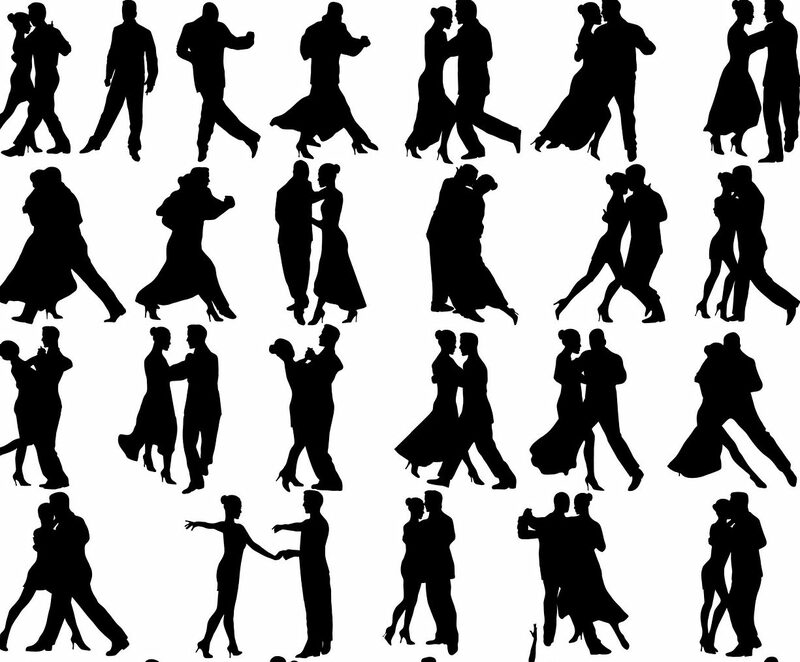 Most tango social dances, milongas, take place in small venues, similar to the Buenos Aires neighborhood dance halls in which they began. Pat started attending milongas, and grew to love the music and culture surrounding tango. "The dance is total improv, it’s similar to jazz and blues in that way. You learn a few basic steps, and those can be chained together in whatever sequence the music wants you to do, whatever skill level you or your partner has, or how much room you have on the dance floor." "We dance to a lot of the same music every night, every week, for months and years, and you’d think we’d get bored, but it’s always fresh - it’s a curious thing. You can dance five times to the same song, but it will always be a different dance." Tango dancing appeals to Pat because it demands her complete attention. "I love that you have to be engaged. It’s a very cerebral dance. You’re not just learning patterns, it’s not choreographed - for me that’s a huge appeal. You have to be able to read each other’s movements and respond. The connection with the music and your partner is a different level of dancing." Pat tries to get to Buenos Aires at least once a year, but she also appreciates the tango opportunities available right here in Austin. She finds a milonga to attend almost every evening, and has developed a deep connection with the tango community. "You can dance every night in Austin. Occasionally people will host milongas in their homes - those are always lovely. Someone who’s even more an addict than I am has built a room off her house just for tango dancing." According to Pat, tango seems to attract quite a wide range of enthusiasts. "Our group has everything from aerospace engineers to US Postmen to 28 flavors of teachers. At the moment, I’m the only geologist in the group. It’s a wonderful melting pot, and you can meet people you might not otherwise have a chance to cross paths with. It’s almost like a clan, in a way, but without any blood relations." Pat is drawn to the universal appeal of tango, finding similarly zealous dancers in her travels around the world. "I’ve danced in Reykjavik, Oslo, Auckland, Santiago, Quebec, Vancouver, several places in Argentina, and many US cities. It's this shared music we all dance to; it’s a comfortable thing when traveling." Pat has seen the Bandini-Chiacchiaretta each time they've performed in Austin. She admires their impeccable skill and originality. "Bandini-Chiacchiaretta carry some of the original feel of the music; they retain the legitimacy of it. Their selection of pieces is authentic, older, more traditional tango - the classics. They play animatedly, it's wonderful." Join us April 6th & 7th for a performance unlike anything you've ever seen before: Oliver Rajamani's Flamenco India with Jerónimo Maya! For tickets and more information, click here. “Going to that school changed my life. I had this upbringing that was so different from the normal Indian child and way of thinking. I couldn’t connect with my family, or people from my own country, or anyone in American Western culture either. No one could really understand my life; there were times when I just felt alone." 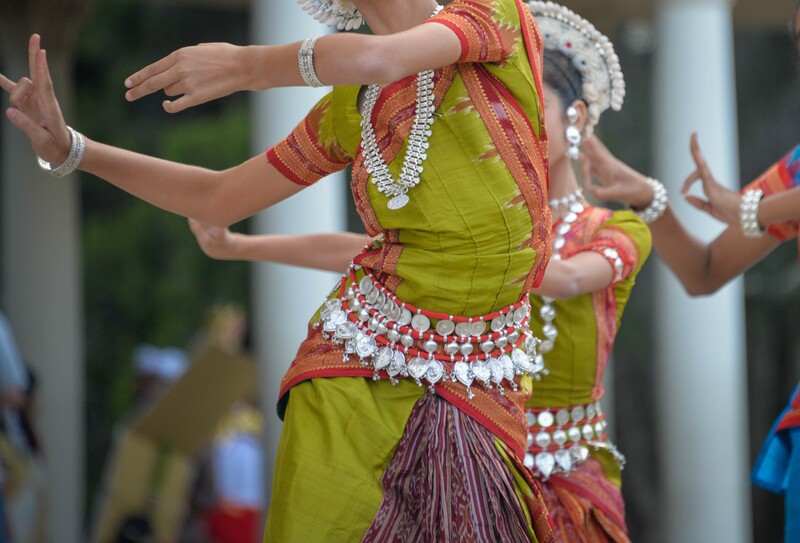 Rajamani feels strongly that people should experience cultures outside their own. He moved to New York in 1989, studying in an unconventional college that viewed education as an exploratory time for students to immerse themselves fully in an area of interest, and not to be sequestered into ‘learning from the books,’ so to speak. Ethnomusicology was not yet a broad field of study, so Oliver Rajamani pieced together his own version with a dual degree in sociology and music. His study of music actually began much earlier, during his school days in India, when he played onstage with his uncle's band and encountered the folk music of villages. He was also exposed to Western classical music as a percussionist in his school’s band. After coming to the US, his appetite for music grew stronger. Rajamani was aimless during his college years; he enjoyed music and meeting new people, but didn’t know what he wanted to do beyond that. An anthropology professor gave him a book about the Romani people, thinking the open field of study relating to his home country might interest him. The Roma migrated from India in waves beginning in the 11th century. They adopted elements from each culture in which they lived as a survival method, but kept very secretive out of fear of discrimination. The Romani people have been misunderstood for centuries, their persistent seclusion allowing for each group they encounter to create myths and prejudices about their beliefs and behaviors. Rajamani began playing with a wide range of Roma musicians, along with Non-Roma (Gadje) musicians, in New York. Through those musical connections, he met someone who would have a major influence on his future: Dr. Ian Hancock, the UN Ambassador for the Romani Congress and the world’s head scholar in Romani studies. Hancock connected him with the Romani Congress, where he ended up working for four years. Dr. Hancock was a linguist and professor at the University of Texas - Austin, the location of the world’s largest historical archives of Roma, and he encouraged Rajamani to move there. He thought Rajamani would benefit from its diverse music scene. The coalescence of Rajamani’s deep connection with Romani cultures, his unique musical flavor, and his move to Austin all provided fertile ground for the birth of Flamenco India. 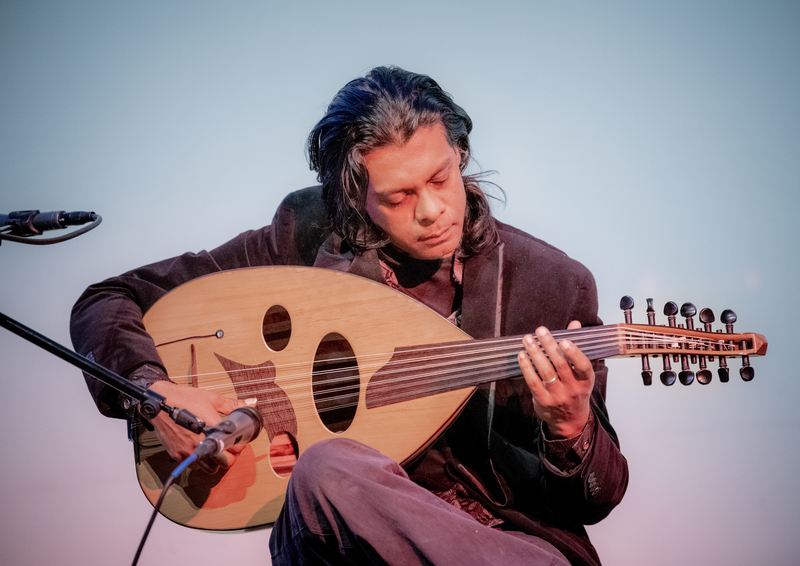 Through his time spent with Romani people, and his acquaintance with flamenco guitarist Arturo Martinez, Rajamani learned about the Indian roots of flamenco. He was collaborating with flamenco artists and emphasizing its Indian components, such as Indian folk songs, to demonstrate its rich history to his audiences. This innovative approach evolved into Flamenco India. Flamenco evolved from the cultural and spiritual identity of the Roma in Spain. Historically called 'Gypsies' by various groups, the Roma were known as 'flamencos' by the Spaniards. 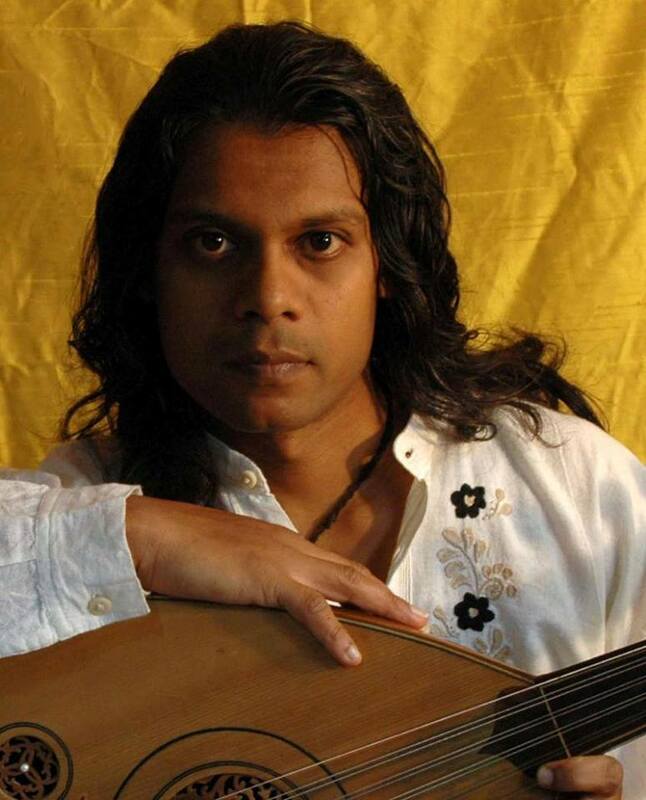 In Flamenco India, Rajamani has brought together Indian musicians, a small string orchestra, Jerónimo Maya - a Romani guitarist - and Indian and flamenco dancers. The flamenco music incorporates Indian and Middle Eastern melodies and harmonies, and the orchestra performs in a style displaying his roots in Western classical music. He acknowledges the influence of place in Flamenco India as well. Our Director of Education, Dr. Travis Marcum, has been collaborating with the Livestrong Cancer Institute’s new CaLM Clinic, opening this spring, at the UT Dell Medical School. 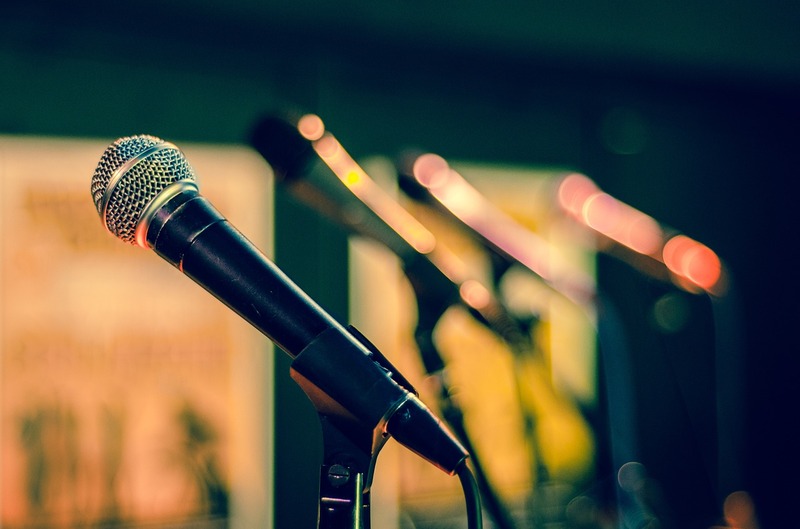 Their goal is to build a holistic approach to cancer treatment, and ACG’s role will be a music-wellness service that includes learning opportunities, personal-story song writing, and performances. He was paired with a cancer patient to develop a process for musically conveying her journey, and together they wrote a beautiful song that you can listen to here. We recently had the chance to sit down with Christina and hear about her experience. A loving mother, wife, computer programmer, knitting aficionado, and athlete, Christina is spunky, matter-of-fact, and fearless. Her willingness to persevere and accomplish whatever she sets her mind to has driven her to run marathons, craft complex and time-consuming knits and quilts, and apply for her dream job. She never thought she’d win the web developer position for her favorite knitting website, but the motivation to apply despite her skepticism led to her appointment as one of only four full-time employees on Ravelry. 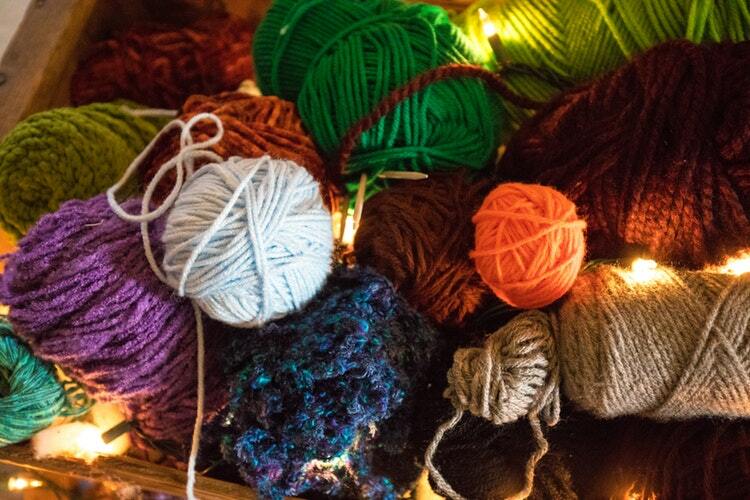 The tiny staff works remotely from three states around the country, and provides a knitting and crocheting community resource for a following of 8.5 million members around the world. Christina was lifting weights and running multiple times a week when she began to notice back pain. She thought it was from strenuous exercise, but as she began to investigate the cause, she learned it was due to a tumor pressing against her tailbone. She’s been in treatment for a majority of the past three and a half years. Recently, she was asked to be a member of the CaLM Clinic’s Advisory Board. The CaLM Clinic focuses on three crucial elements cancer patients seek: a sense of calm, a feeling of capability, and being comfortable. Travis Marcum attended one of the advisory board meetings to see how ACG could assist the CaLM Clinic programming. When he talked about the Lullaby Project, Christina was instantly hooked. Travis asked her to help pilot the program, and together they worked on a piece of music that would be meaningful to Christina. “I knew I wanted the song to sound like Sufjan Stevens. Also, I had found out only a month before we started this process that that there’s no cure for this cancer, so I already knew what I wanted to say." "I really wanted to tell people I know I’m in this weird space, and I’m certainly going to feel hopeful because medicine is changing. But hear this news and don’t be in denial ... also, I’m ok."
The phrase Miles to go comes up frequently in Christina’s song. It served as a mantra during her marathon-running days, reminding her that I’m present in this moment - where there are still miles to go. During the pregnancy with her daughter and subsequent maternity leave, Christina spent 40 hours crafting a uniquely-stitched quilt that says Miles to go. 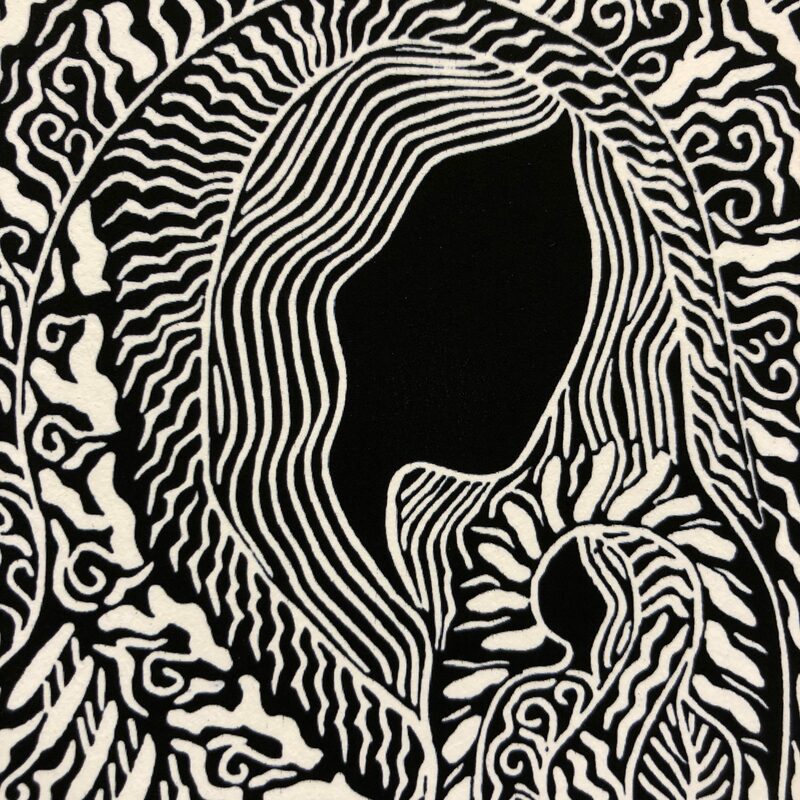 The lyrics incorporate quilting imagery: "I can darn me where I’m worn/Mend me where I’m torn." She receives treatment at a cancer clinic in Houston, and the drive to and from the center also plays a large part in the lyrics. "I can bear the weight/I can bear the wait," begins the chorus. She finds it comforting to take the same route each time, and one of key landmarks is the Starlite Drive-In Movie Theatre. Her mantra of Miles to go has been encouraging as she's traversed the treatment process. Christina’s seven-year-old daughter plays piano, and Christina really wanted her to play in the song. Travis wrote out a part for her to practice at weekly lessons, and professional guitarist and songwriter Claire Puckett came over to their house to record it. Christina’s daughter aspires to be a professional musician, so she peppered Claire with questions about a musician’s life, and could barely contain her excitement at the answers. Christina appreciates the assistance of Travis, who knew how to get at the heart of what she was saying, and Claire, whose production and orchestration skills helped create a beautiful song. Christina was recently filmed in a video about the CaLM Clinic that will screen at SXSW in a few weeks. The Clinic is pretty unique in its field, and there will be several representatives speaking about their work to other medical professionals. She's been asked to speak about her experience in a panel, and they'll play her song with the lyrics up on a screen. We recently spoke with a senior at Crockett High School. He performed with Crockett's guitar ensemble at Guitars Under the Stars, our annual education gala, and he was also one of the three speakers for the event. 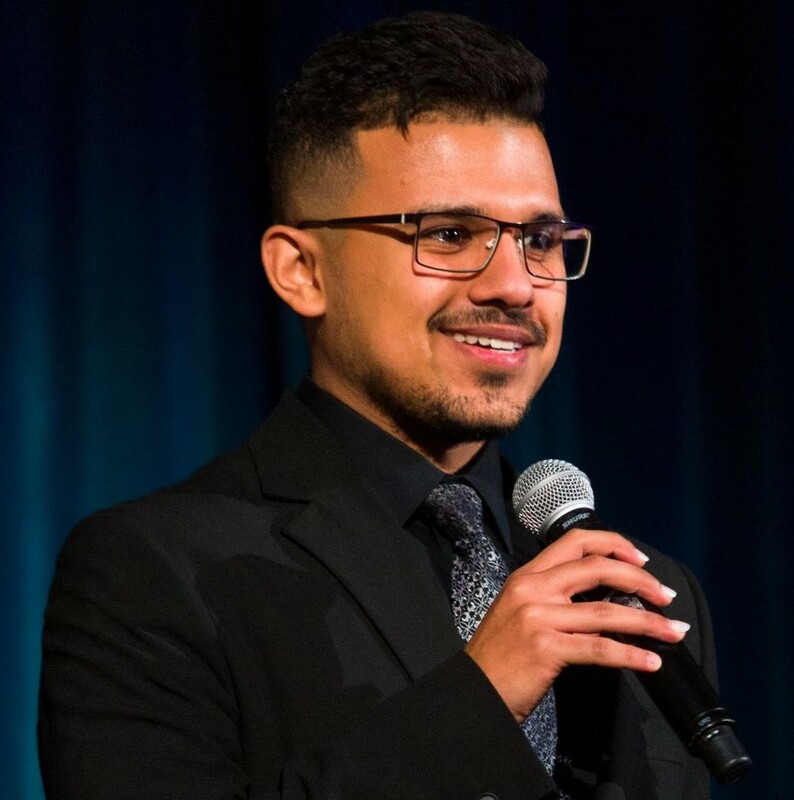 He even has a special connection with the featured artist for the gala, Berta Rojas. We wanted to share his story with you. Rey Rodriguez began playing guitar seven years ago as part of a pilot program at Bedichek Middle School. 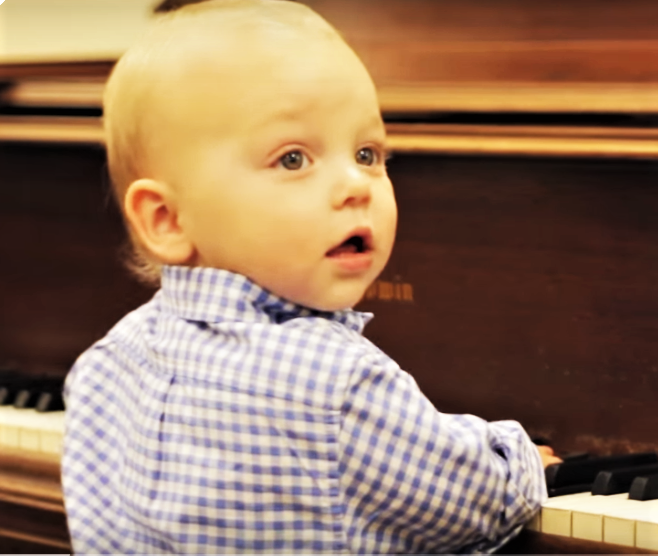 The first musician in his family, he quickly learned that with music, the more he gave, the more rewarding it became. "If I respect people and show them I can work hard, they'll present me with different opportunities, and allow me to grow as a musician." Rey has always appreciated the welcoming environment of his guitar class, and finds the lessons in teamwork especially valuable. "At Crockett High, my ensemble is like a second family, my family away from home. I can tell them anything, we're all close. The ensemble setting teaches me to work with others, and to have the discipline to work on things for the group." One particular experience early in his high school career had a transformative effect on his future. In January of his freshman year, Berta Rojas came to Crockett High to give a masterclass. "She came in and I was thinking, OK, she plays guitar, that's not new - lots of people can play the guitar. 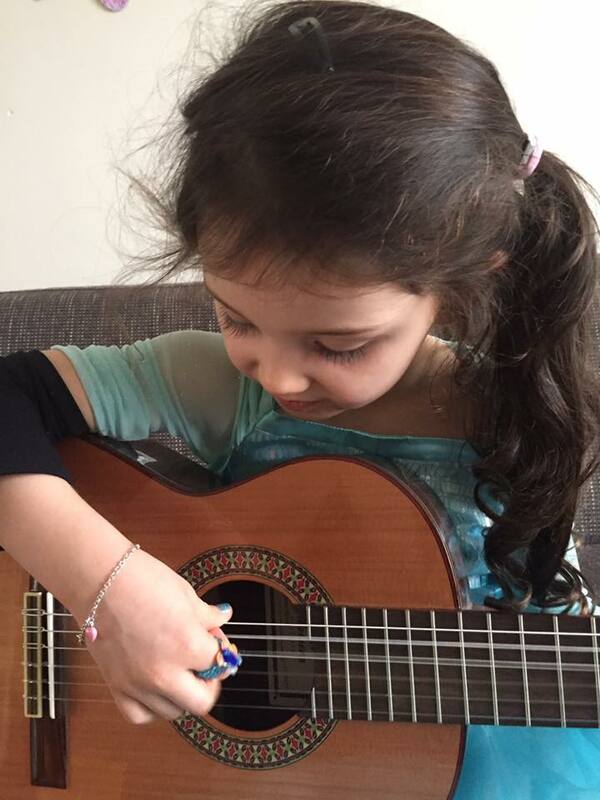 But when she started playing, I learned that I've been listening to guitar wrong my whole life." Rey broke into a wide smile at the memory. "Berta was very inspiring. I'd never seen such an amazing musician, and she was very kind and motivating, and really wanted to help us learn. I learned from Berta that you don't always have to be robotic when you play, that you can express the music and still play beautifully." 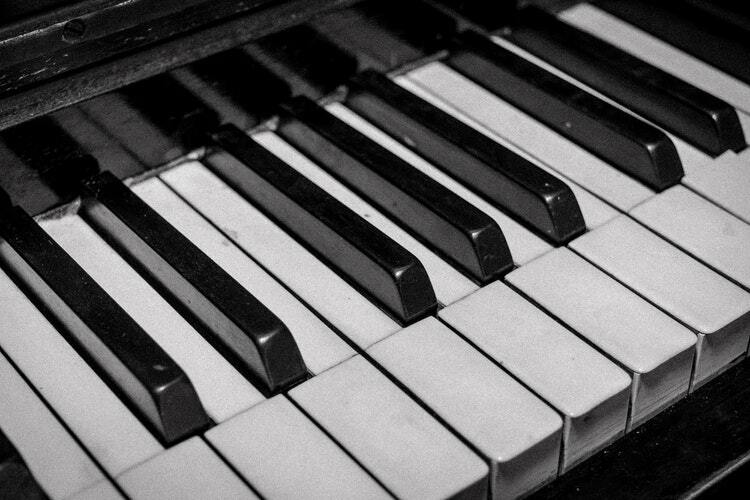 "Up until then, I had no idea music could be so expressive. I realized that's what I wanted to do: be a solo musician." Asked if he was excited to talk to Berta at the gala, Rey demurred. "I was starry-eyed over a celebrity; I doubt she remembers me." Rey is now applying to college to pursue a performance degree in guitar. 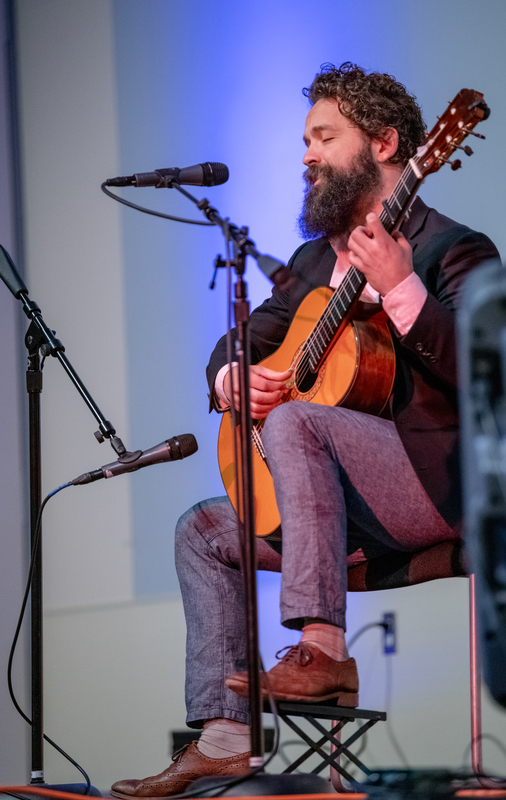 He is especially grateful he stuck with music because of opportunities like this Saturday night, when he performed with the Crockett High School Guitar Ensemble right before Berta Rojas took the stage at Guitars Under the Stars. "Guitar is my life, and without ACG, I don't think I'd be as happy doing what I'm doing, and I wouldn't be the person I am today. ACG has allowed me to achieve new heights as a musician that I would've never been able to reach on my own." We're so fortunate to partner with local artists for our International Series at the Austin ISD Performing Arts Center. On Saturday, January 22nd, the work of Caitlin McCollom will be displayed in a beautiful and fascinating exhibit in the lobby for Irina Kulikova's concert. We had the chance to speak with Caitlin, and she shared some insight into how she became an artist, what influences her painting, and what she portrays in her work. I was calling myself an artist even as a little kid. I loved to paint and draw, and I had a super-active imagination and strong connection to spirituality. I grew up in Dripping Springs when it was still rural, so I was very connected to nature and bucolic solitude. I hated school very much; I couldn’t wait for it to be over. When I went to college, I decided to major in painting. It wasn’t a supported talent when I was younger, so getting to study it professionally made it apparent that it was not just a passion, but something that would be my whole way of life. I started showing exhibits when I was a junior in college, and continued to show all over Texas after graduating. I also ran a little gallery with the intention of supporting other artists, but it was really a way to meet as many artists in the community as possible. Then, I moved to New York City to get an MFA and pursue my career there. Shortly after moving, I acquired a chronic genetic disease and fell very ill. I spent some time in the hospital, then moved back to Austin. I was desperately ill, couldn’t work at all, and didn’t really have any money, since I’d just moved to New York. It all just fell apart - I had to start my life over. But it was an amazing time to learn what I really wanted out of my life: to be a full-time artist. It took me six months of doing nothing but healing, and then I got back to work once I saved up enough money for art supplies. As an artist, I have a compulsion to create. The hardest part of the illness was that I couldn’t work for a while. In New York it’s really expensive, it's a really hard way of life. As a full-time artist, I can live a lot more inexpensively in Austin. I’ve been a full-time artist for a few years now, which was my dream! I don’t know if that would’ve happened in New York. I feel like I’m exactly where I need to be. Do you feel that art helped you with the healing process? 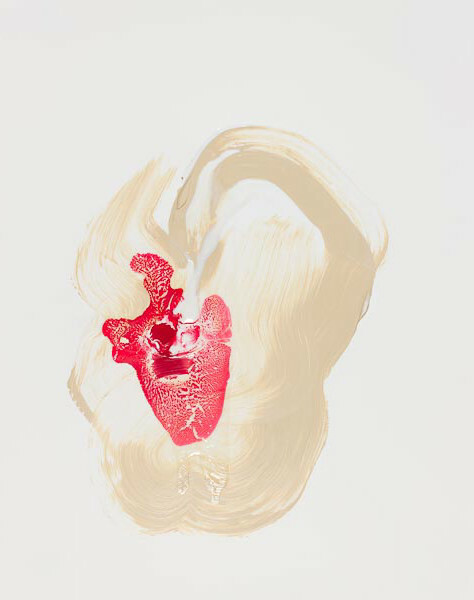 When I was finally able to work again, I made this series called “Blood and White,” which was all about the fragility of the body, and the physicality of disease, and trying to make fragility and disease look beautiful. It was made in a stark way, but also in a way that had a very strong aesthetic component. I was trying to communicate to people where I had been the past year ... that was healing. Did your illness inform your aesthetic sense? I definitely have a very particular aesthetic sense; I always paint in red, I love the symbology of it. 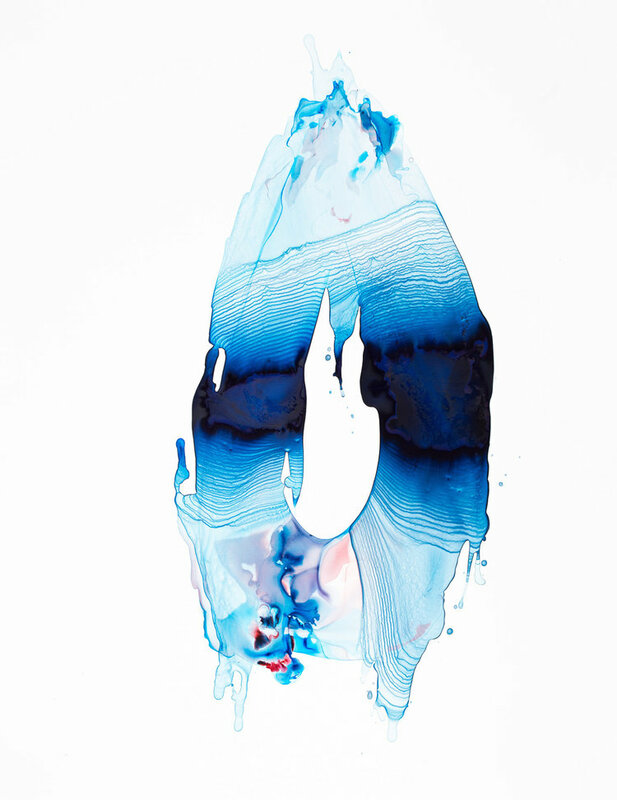 And in my work from 2014, while I was healing, I had this strong urge to use the color blue because I was trying to communicate the idea of water as a symbol of the spiritual realm. I read this book called the “Cloud of Unknowing,” an anonymous medieval text on early Christian mysticism. In it, there were beautiful, specific instructions for having a mystical experience. It was fascinating. The author talks about this idea that the way to experience God is through entering the cloud of unknowing: with no preconceived notions of what God is, and no knowledge of anything beyond your existence in the moment, God gives you a spiritual experience. Around that time, I became fascinated by a weather phenomenon in South America called a Garúa: a low-hanging, transparent cloud that can appear suddenly. You don’t know it's there unless you pass through it - it's so dense that your body becomes soaking wet. The garúa reminded me of the ‘cloud of unknowing’, and I realized that water was a symbol of the spiritual realm. What I try to say in my work is that what's completely real can be absolutely invisible, and you only know it’s there from experience. What message do you convey in your work? 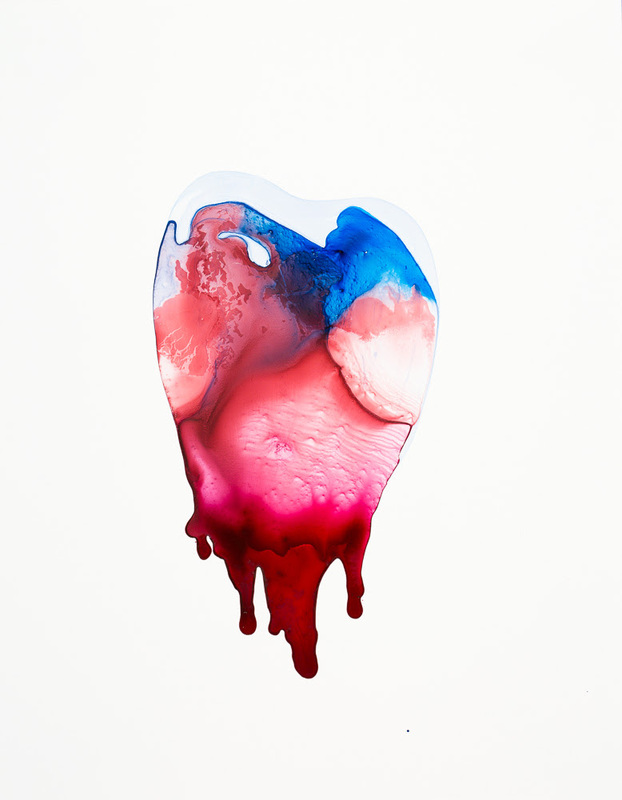 The red is physical, and the blue is spiritual. You have this physicality, this red blood, and then something happens beyond you, and it’s like the water of the spirit realm mixing in with your blood. 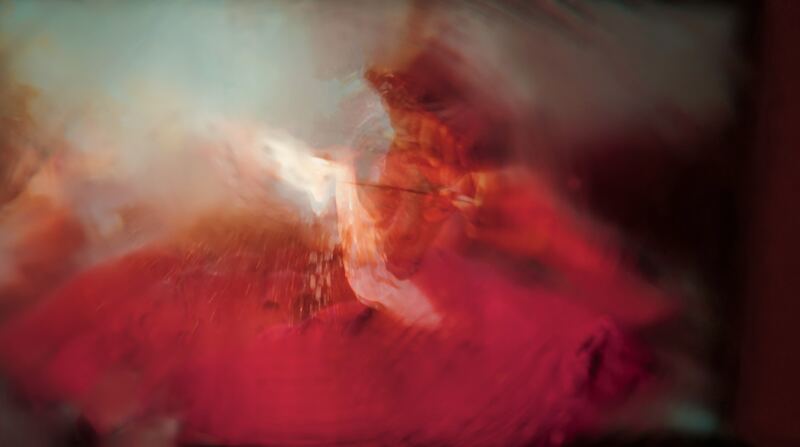 It’s swirling all around you, and you feel the sense of being infused with something beyond yourself. It’s similar to the invisible experience of music causing a strong emotional reaction. The abstraction of my paintings can purify meaning without confusing the viewer with a concrete subject, but each of my paintings has a specific shape. There are teardrops, orbs, hearts; these shapes are all Jungian symbols with universal meaning. 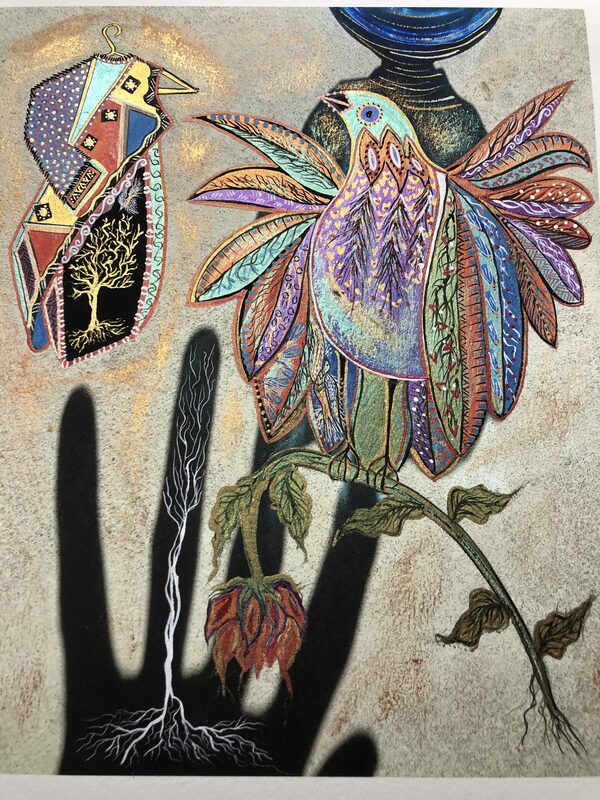 I try to have layers of symbols in my paintings to make them universal, but also very personal, so people can see their own lives and the meanings ascribed to them. What inspires me most is people’s stories about spirituality, and about near-death experiences. Each painting has its own kind of message, and reveals itself to me in a different way. I can tell if a work is successful or not if someone looks at one and says it means to them the same thing it meant to me when painting it. 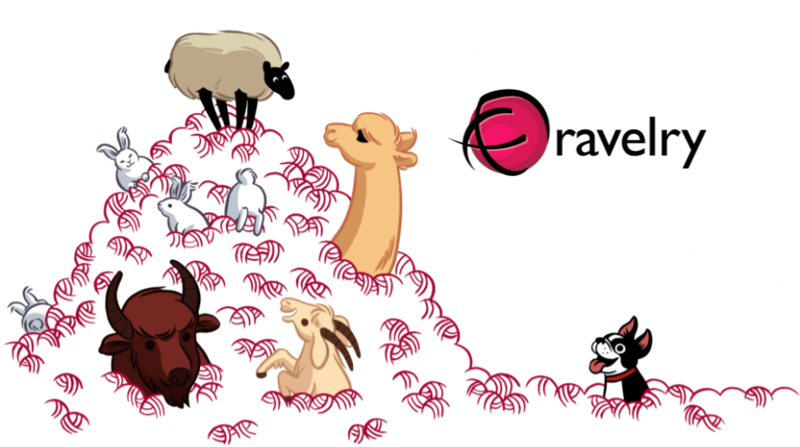 It’s a visual language, so if it’s not translatable, I feel it’s not very successful. I really try to have a painting mean something attainable. 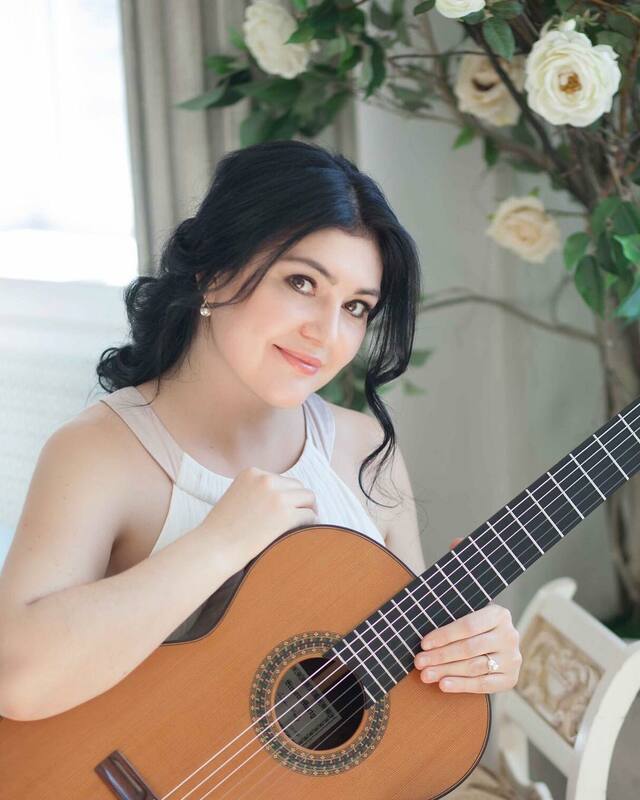 Our first International Series concert of 2019 features the fabulous Russian guitarist, Irina Kulikova, whose musical elegance, beauty, and power have captivated audiences around the world. We can't wait for her Austin debut on January 26th! Irina Kulikova, a daughter and granddaughter of musicians, grew up listening to her mother play cello. She taught private lessons and played in a quartet, and Irina remembers often accompanying her mother to the “Wedding Palace” to hear her perform for ceremonies and receptions. “I was always there, and always naughty,” Irina recalls fondly. Her mother had a profound influence on her, musically and otherwise. 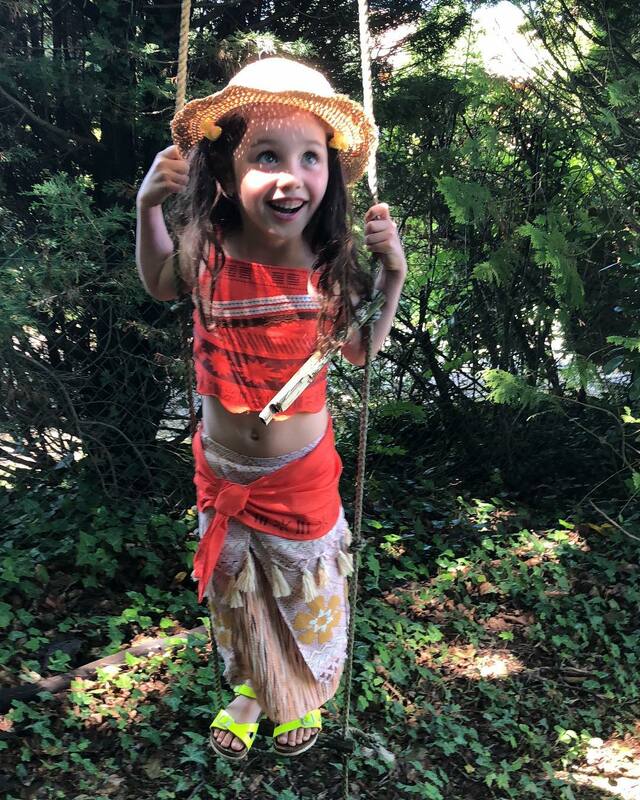 When Irina was five, she wanted to play either the violin or cello, but her mother insisted she start on guitar because it was “easier to play in tune at first.” To this day, Irina strives for a cello-like sound in her guitar playing, and says she has a strong cello technique. Irina believes her mother was the anchor of her family when she was little. 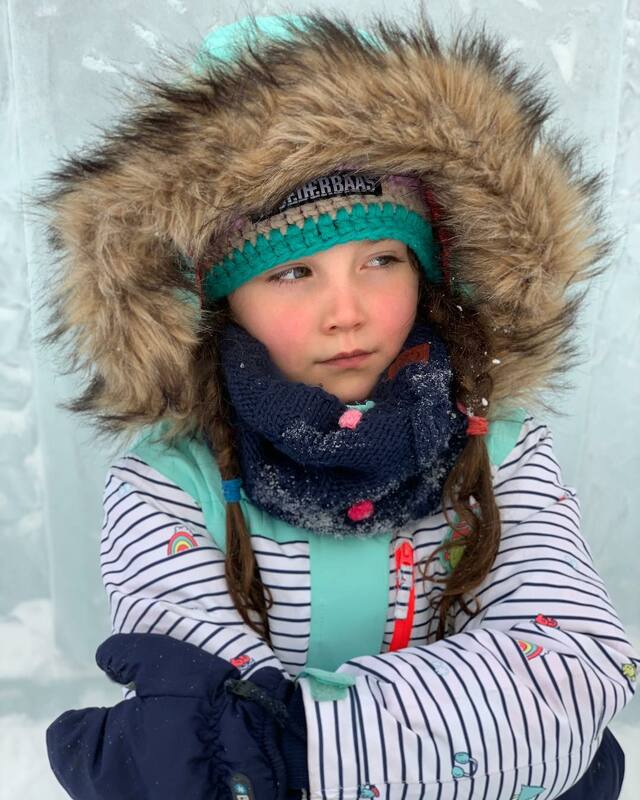 When Irina’s father lost his factory job during the collapse of the Soviet Union, it was her mother who supported the family, balancing three jobs with caring for Irina and her younger brother. 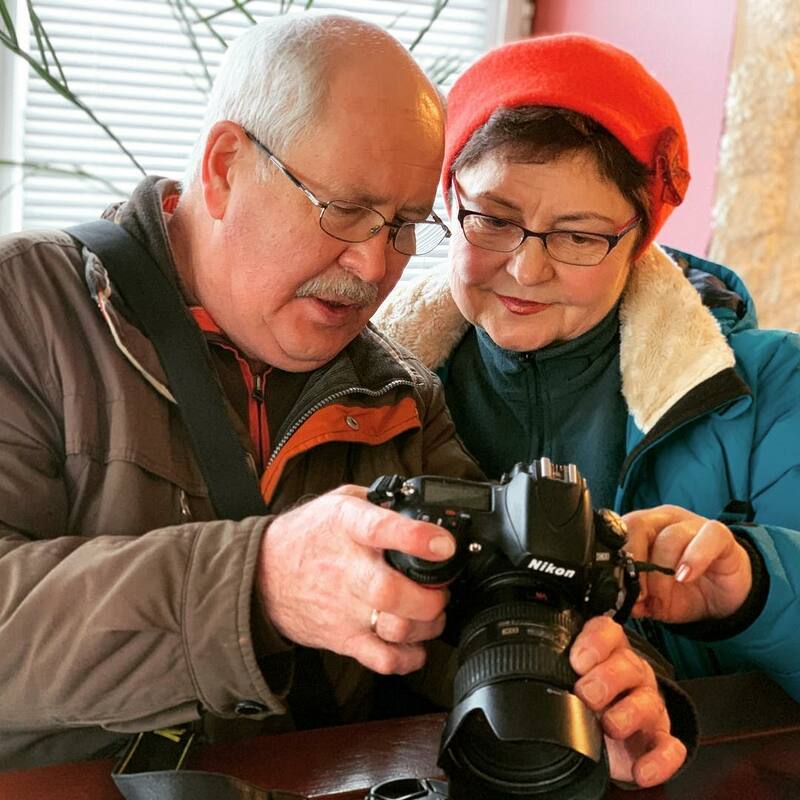 Irina's father pursued his passion of photography, and today has made a career of it. Just as Irina's mother introduced her to cello, so too is Irina exposing her daughter to the world of music. Mariëlle is six and a half, and already plays piano, acts, and sings. 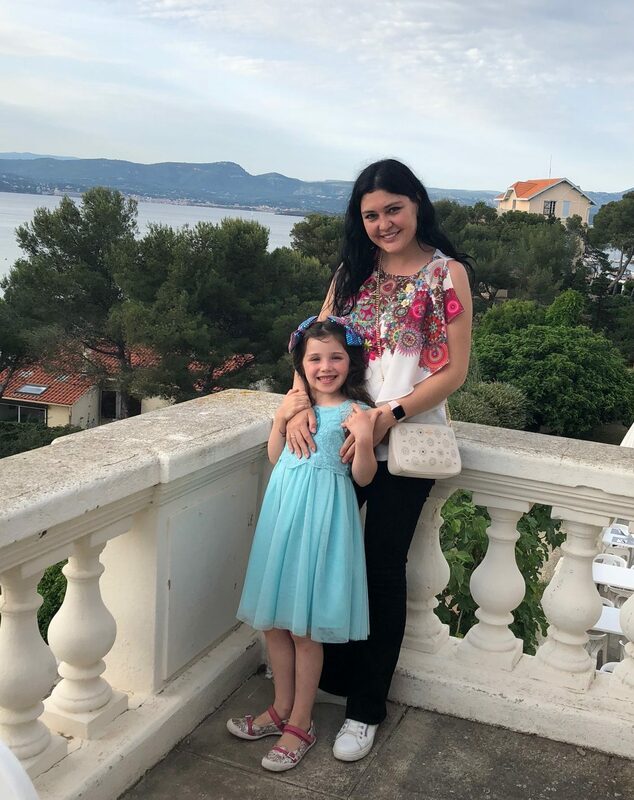 She's strong-willed and free-spirited: Irina considers it a success if she can choose her daughter's clothes even one or two days a week. She also sees a lot of herself in her daughter. Mariëlle is always close by when Irina gives lessons, listening quietly while occupying herself with something tactile and creative, such as drawing or playing with clay. Mariëlle doesn’t travel with Irina during her concert tours, as Irina believes the traveling life of a performer is too hectic. Irina never worries about her while she's gone though, because, "I feel confident that when I’m away, she knows exactly what she wants, and will do fine." “My main goal in life is to make people happy: I make my daughter happy, I love cooking for my family and friends, and when I play in a concert, I bring a message with my music. People with sparkling eyes come up to me after a concert and say 'Thank you.' When you see people so happy because of your playing, it’s an incredible exchange of energy, it’s so meaningful and so important." Though touring can be arduous and lonely at times, Irina admits she’s grown accustomed to life on the road, and at this point, it’s just a fact of life. Irina also loves meeting new people, and finds performing greatly rewarding. She loves US audiences in particular, since they enjoy contemporary music and always give her amazing feedback after concerts. She did have to get used to speaking from the stage, as that is not customary in Russia, but now finds it easy to break the ice with even the most non-responsive audiences. Irina, who has never been to Austin, is especially excited for her visits to four local schools, and for the masterclass she’ll be teaching at the University of Texas. Last fall, we began a program with Strait Music Company. Thanks to their generous support, we now offer all middle and high school students free tickets to our entire International Series 2018-19 season at the AISD Performing Arts Center. 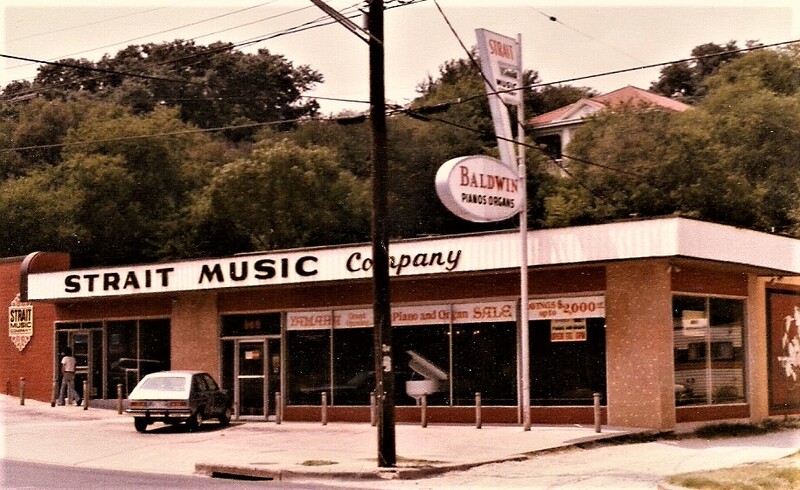 We’d love to share with you the story of this beloved community business, along with some words from Clint Strait, the family’s third-generation to lead the music store. 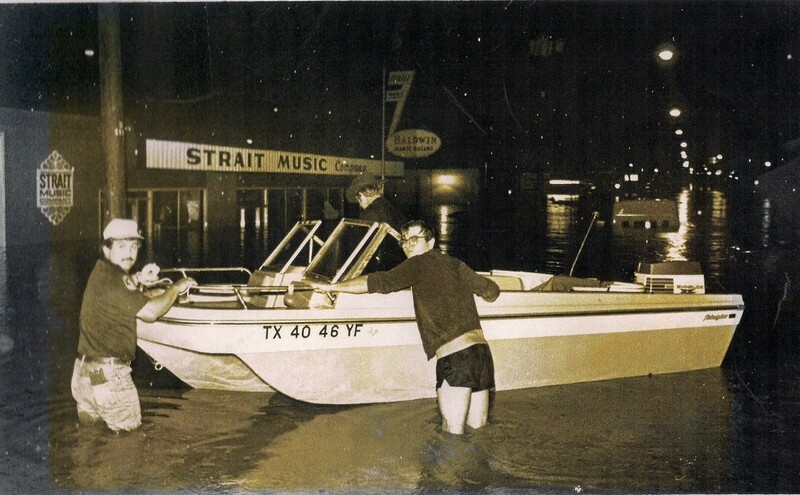 After quadrupling in size, moving three times, opening a second location, and enduring two major floods, Strait Music Company now rests in the hands of Dan’s grandson, Clint Strait. The full-line music store has expanded from only pianos and organs to almost all musical needs, including guitars, band and orchestra instruments, Pro Audio equipment, amps, and keyboards. They also provide service to all items on sale, employing twelve repair technicians, three guitar luthiers, and one orchestral luthier. “We’re very proud of the rich history. This store is all we know, it’s our extended family. A lot of people have been working here as long as I’ve been alive, some longer. They’re why we’re successful. 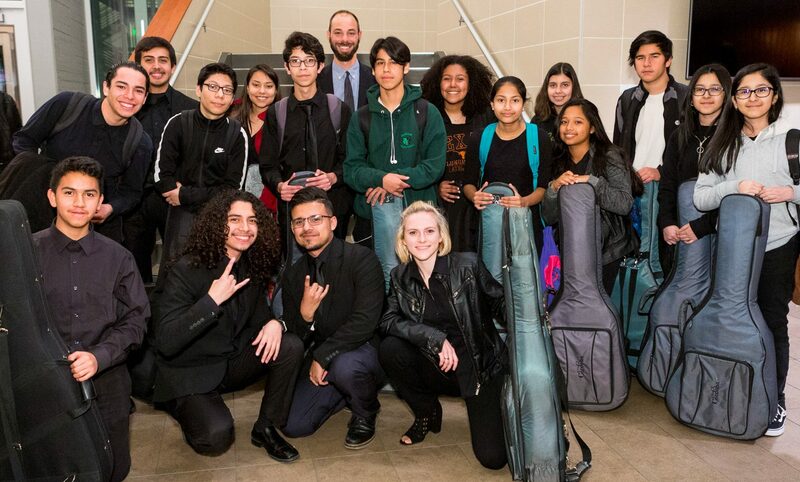 Clint’s enthusiasm for music translated into a collaboration with ACG: “Strait Music Tickets for Kids“, a program offering free tickets to all middle and high school students in the Austin area for our International Series Concerts at the AISD Performing Arts Center. Attached to every ticket is a 10% discount to Strait Music.